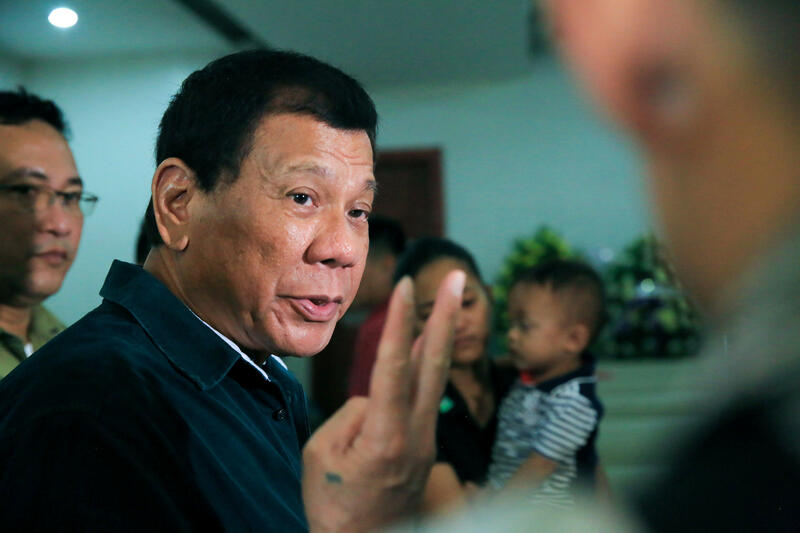 WASHINGTON -- When Philippine President Rodrigo Duterte sits down for his first face-to-face bilateral meeting with President Trump on Monday in Manila, he is expected to come to the table with an unusual request. Duterte wants the United States to return war trophies seized more than 100 years ago: three historic church bells that were taken from the Philippine village of Balangiga after a bloody clash during the Philippine-American War. In 1899, fighting broke out between U.S. troops and Filipino nationalists after Spain ceded control of the Philippines to the U.S. following Spain's defeat in the Spanish-American War. The nationalists seized control of the main island in the Philippines and declared a republic, vowing not to succumb to American imperial rule. More than 200,000 Filipino civilians and 4,800 American troops died in the ensuing conflict, which formally ended in 1902 as the U.S. suppressed the uprising. The guerrillas overwhelmed the soldiers, killing an estimated 38 and wounding 22 more. Just four soldiers emerged unharmed. It was the worst defeat for the U.S. Army since the Battle of Little Bighorn in 1876. In retaliation for what the Americans called the "Balangiga massacre," Major Gen. Jake Smith ordered troops to reduce the island of Samara, where Balangiga is located, to a "howling wilderness." He directed the wholesale killing of civilians, including every male over the age of 10. Smith would later be court-martialed for his actions. During the campaign, soldiers razed Balangiga to the ground and seized three massive church bells, which came to be known as the "Bells of Balangiga." The Philippines won full independence in 1946, but the U.S. kept the bells. Filipino officials tell CBS News that Duterte is expected to bring up the dispute over the bells when he meets with Mr. Trump -- 116 years after the end of the war. In 1904, an Army unit that was not involved in the battle brought two of the 600-pound bells captured from the church to F. E. Warren Air Force Base in Cheyenne, Wyoming. Today they're on display as part of a memorial at the base, which houses 150 intercontinental ballistic missiles. Due to the high level of security on the base, the memorial is closed to the public. The third bell is held at Camp Red Cloud, an Army outpost in South Korea. Filipinos have long called on the U.S. to return the bells. In July, Duterte said that the bells are symbols of heroism, reminding Filipinos that their ancestors died resisting American colonialists. In his State of the Nation address, Duterte called on the U.S. to return the bells. "Give us back those Balangiga Bells," he said. "They are ours. They belong to the Philippines. They are part of our national heritage. Isauli naman ninyo. Masakit yun sa amin (Return them to us. This is painful for us)." "We are aware that the Bells of Balangiga have deep significance for a number of people, both in the United States and in the Philippines," he said. "We will continue to work with our Filipino partners to find a resolution." In October, Duterte brought up the bells when he met with Secretary James Mattis on the sidelines of a meeting of defense ministers from the Association of Southeast Asian Nations (ASEAN) in the Philippines, according to incoming Philippine Ambassador to the U.S. Jose Manuel "Babe" Romualdez. However, the VFW's Department of the Pacific adopted a resolution in June asking Mr. Trump and Congress to take action to return the two bells in Cheyenne, calling it "the right thing to do" and saying the move would "result in national jubilation" in the Philippines. But the resolution was rejected during the VFW National Convention in July. Some Wyoming VFW members are still opposed to the idea. "The bells are not a war trophy," John DeRouen, the former quartermaster at VFW Post 1881 in Cheyenne, told CBS News. "They are a monument to those of our members killed during the revolt...The bells should stay here." Another member, Cheryl Shannon, told CBS News she believes that all three bells should be returned. "When I served in Iraq, we were told we could no longer take war trophies," she said. "Part of me feels like these were war trophies they tried to make into a memorial and I'd like to see them go back to where they rightly belong." Lately, the local Wyoming VFW has settled on a compromise. As a whole, Shannon said the group would prefer to return one of the bells in Cheyenne and keep the other. They would like the third to remain at Camp Red Cloud in South Korea. In mid-October, Shannon met with Department of Defense staffers and communicated that position. A spokeswoman for the 90th Missile Wing at Warren Air Force Base, 2nd Lt. Nikita Thorpe, said the decision over whether to return the bells lies with Congress. "As property of the U.S. government, only Congress can make decisions of ownership over the bells. F. E. Warren houses the bells at their discretion, and will continue to do so until directed otherwise," she said. But Congress could be poised to hand over that power to the executive branch. Just this week, House and Senate members tucked new language into the National Defense Authorization Act (NDAA) that would allow Mr. Trump to give the bells back under two conditions. The legislation says Mattis must certify that returning the bells is in the national security interests of the U.S. and ensure steps are taken to consult with veterans organizations and local government officials in Wyoming. If the current version passes the House and Senate and Mr. Trump signs it into law, a decision about the fate of the Bells of Balangiga would then lie with the Department of Defense and, ultimately, the White House.